“This is the bridge that stretches to the edge of the world. Its lower steps beckon for the brave and the curious to step up and begin that trek. It arcs out across the sky… but then it goes no further. She stands there upon the edge and wonders where to go from here. The sun dazzles the eyes from above and shines in a shimmering ribbon of light along the river that etches out the canyon so far below. There is a crystalline, timeless quality to the air this high up. It is charged with static that sparks like all the potential she knows is waiting for her here and waiting inside her. Each breath chills and exhilarates. She sees the wands of those who have come this far before her, and perhaps from here they turned back, daunted by what the next step may be. She pauses a moment, does not look down, and then steps forward into what seems to be empty space. She feels sturdy rock and shale materialize under her feet. She realizes then that this entire bridge has been built by the steps and the dreams of others. She takes a breath and then begins to make her own strides – she takes the next step, and the next, and the bridge begins to grow beneath her feet. This is the ultimate test of faith. Stepping out into the great unknown; way out of your comfort zone and into something brand new. Walking away from lessons learned, walking away from the pain, the anguish of learning them. Walking away from those who no longer fit into your life as they once did, and walking towards something amazing. We only have our faith, our trust to guide us. We have hope, we have our own hearts and souls whispering words of encouragement. It is time. Surrender to the new. Embrace it. Trust. Know that this leads to something better, even if it is painful right now. There may be disappointment, there may be disillusion. Let it go, it was never what you thought it was, or wanted it to be. Know that as one door slams shut, another one opens. Maybe you are a little far away to see the door. Maybe you have to keep moving forward to get to it. Maybe you need a little time to heal, to contemplate and to assimilate the new energies before you get there and walk through it. For now, focus on the leap. 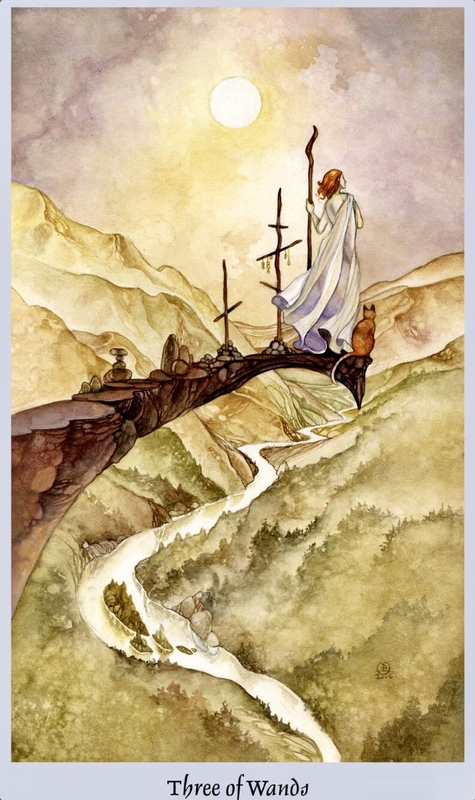 Focus on walking across the bridge that forms itself over the chasm with every step you take. This is magic, this is alchemy. You also change as you take each step. There is no going back, only forward to where the magic lies.